On the site of the former concentration camp Kaufering VII it was planned to create an area memorial, a place of remembrance without any monumental sculptures or playful design, where we can commemorate the Jewish victims of the National Socialism at the concentration camp commando unit Kaufering. Central element of the installation is a scree slope that shall cover the whole area of the former „Apellplatz“ (the place for roll call). The scree slope is intended to represent an extreme contrast to the surrounding landscape, the lovely Bavarian foothills of the Alps . This memorial shall resemble a gaping wound in the landscape in order to underline the special character of the site. The scree slope shall consist of 14.500 differently shaped stones of different sizes. This shall make the abstract number of people killed in the concentration camp Kaufering comprehensible and tangible . On the one hand the stones stand for the Jewish tradition in which they represent the memories of the dead, (everlastingness) and on the other hand they symbolize the individuality of every single victim. 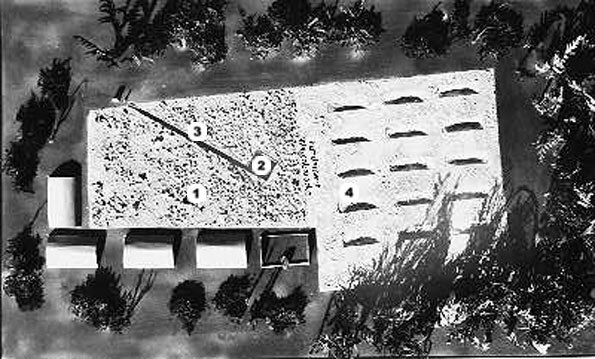 So they counteract the dehumanization and deindividualization of the concentration camp internees, especially on the „Appellplatz“ where they had to line up according to numbers; the stones in that way appeal to humanness and respect for the individual. The ramp can only be walked by one person and it is the only way to access and leave the memorial room. This creates a feeling of hopelessness in the visitor as if there were no way out. The way back can be understood as a way of turning back – the difference is that the visitor is no longer facing the darkness of the memorial room but the light from outside. 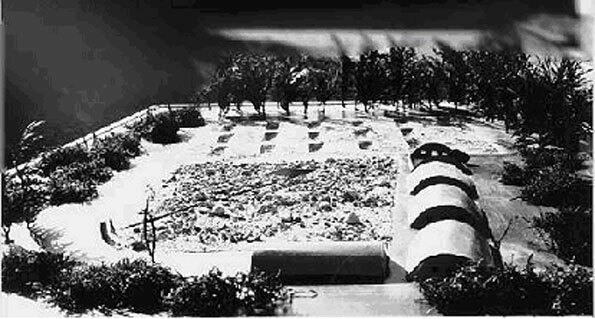 In the rear of the area soft grass hollows shall resemble the structures of the former concentration camp huts, make them palpable and in that way give the visitor an idea of how the camp looked like.